Little Mrs. Married: i am grateful! 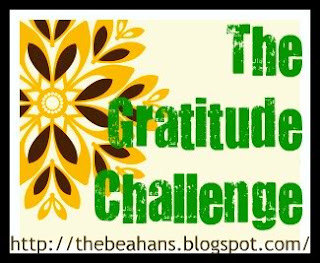 Gratitude Challenge - Day 5: Take five minutes to write about how grateful you are for all the wonderful things that you currently have in your life. Don't long for what you don't possess - instead, take stock of the blessings you already enjoy. I am thankful for my husband & my marriage. He is a wonderful guy & we are very happy. We celebrate 2 years next Sunday & i am thrilled that God brought this man into my life. I love him like crazy!!! I am thankful for my in-laws. Seriously. They are the best. They are fun, sweet, hilarious & generous. I enjoy spending time with them. I know that i seriously lucked out in the in-laws department! I am thankful for my parents & my sister. I love them sooo much! I am thankful for a roof over my head, with plenty of things i need & want, such as electricity, a cozy bed, & hot water! I am thankful that we live within our means & that i have a husband who knows how to handle finances well. I am thankful that we are getting very close to being debt-free. I am thankful that we have 2 cars that are paid for. I am thankful for my extra job at the manship - for the extra money it provides, for the flexible schedule & for all the great people that work there. I am thankful for my friends... i love them all! I have always said that i have been very blessed in friendships. And it is true. I have some awesome friends & i am so thankful for them! Hey Mel, I had a dream last night that we were hanging out and were in my car discussing religion. Haha, weird, huh? What wonderful things! I lucked out with my in-laws too! They're awesome.